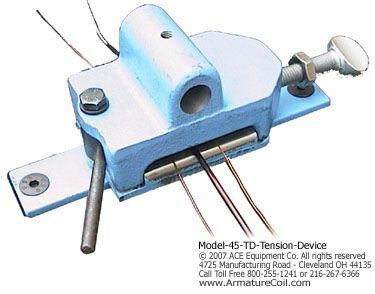 Armature Coil Equipment produces tensioning devices in a variety of sizes. Apart from large scale coil winding equipment, we also focus on creating small sized devices. ACE provide small sized tensioning devices as single, individual products, or as a combination of multiple products. Models 45 and 45-TD are examples of the latter. This combination of devices is designed to support the tensioning of large magnet wire spools. These devices are useful for customers who are looking for winding and tensioning products, which are simple to install, and easy to use. 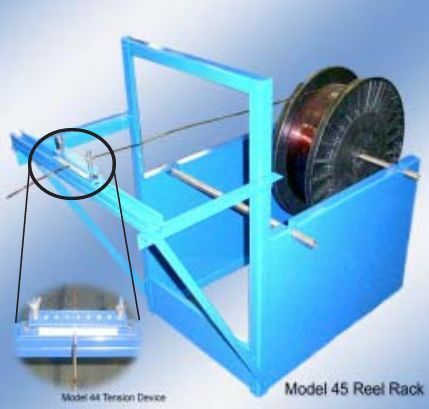 Model 45 is a reel rack and Model 45-TD is the tension device installed with it. The walls of the wire rack consist of two depressions on either side. A pipe or tube that is used to hold and support large magnet wire spools can be placed in these depressions and can be secured with a locking mechanism. At the other end of the rack is a stand, where the Model 45 tension device is mounted. Model 45-TD consists of 7 fiber plates and cam spring for applying pressure. When a wire is drawn from the wire spool, and passed through the tension device, the plates are pushed against the wire from the action of the cam spring. This helps provide consistent and repeatable pressure to the wires. The cam spring action can be adjusted by the operator according to his needs. The tension device can support the tensioning and coil winding of square, round, and rectangular shaped wires. The device is also designed with a cam lever, which can instantly relieve pressure from the wire during setup or disassembly.